According to the latest data from the Ministry of Internal Affairs and Communications’ Statistics Bureau, the total housing stock across Japan increased by 3,050,000 units to 60,630,000 units in 2013, up 5.3% from the previous survey in 2008. The number of unoccupied residential properties increased by 630,000 units to 8,200,000 units, up 8.3% from 2008. The nationwide vacancy rate increased by 0.4 points to 13.5% – the highest level seen since record-keeping began in 1963. It is important to realise that these figures include homes that are vacant for a number of reasons. For example, 5.0% of the vacant properties are vacation homes, 3.8% are empty because they are currently for sale, and 38.8% of homes were vacant for other reasons (eg. due to the residents transferring for work, being hospitalised, or because the homes are in the process of being demolished). 52.4% of the vacant homes were rental properties that were sitting empty. From 2015, inheritance tax deductions will be reduced. As a result, investors have been actively purchasing or building rental apartments as a way to reduce their future inheritance taxes (inheritance tax on real estate is calculated on the tax value of the building and land, which is usually lower than its true market value, while the tax on assets such as cash or stocks is based on its face value. There are also deductions for real estate that is currently rented to a tenant). There is a risk that this trend could lead to an over-supply of rental properties in central areas. According to the Ministry of Land, Infrastructure, Transport and Tourism (MLIT) a total of 987,000 new homes were were built in 2013, up 10.6% from the year before. Of those, 370,000 were rental properties, up 15.3% from 2012. While there has been a slowdown in demand from owner-occupiers, the construction of rental properties has increased for the past 15 months. 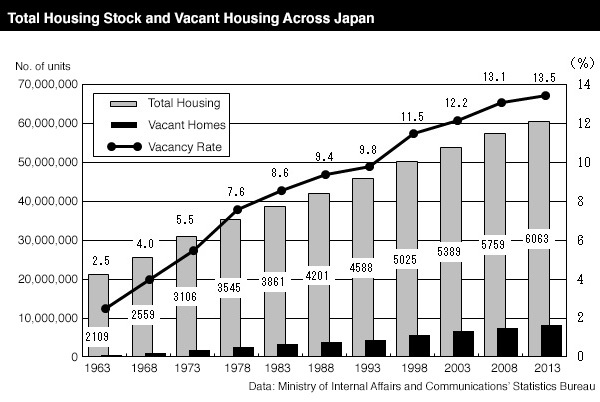 Despite the growing supply of rental properties, Japan’s population continues to decline. The Mizuho Research Institute expects that there is enough demand for 300,000 of the 370,000 rental properties built in 2013. In 2014, they are predicting demand for 290,000 homes, and 280,000 homes in 2015. Vacancy caused by depopulation is not just occurring in rural areas. There is also a growing risk of a potential over-supply of brand new apartments offered for rent in central Tokyo. A report by the Financial Services Agency in July warned that lending by small-to-medium financial institutions to real estate developers who had not properly considered the risk of high vacancy rates in their rental properties was at exceedingly high levels. Yamanashi Prefecture had the highest residential vacancy rate across Japan with 17.2% of homes sitting empty (vacation homes are not included in these figures). The four prefectures in Shikoku took up the next four spots with vacancy rates in the 16% range. Of the total housing stock across the country, 36.4% (22,090,000 units) are in apartment buildings. This is an increase of 1,410,000 units from 2008. In the Tokyo metropolitan area, 70% of the total housing stock is comprised of apartments. The number of owner-occupied homes increased by 6.3%, or 1,920,000 units, to 32,240,000 units. Approximately 62% of homes are occupied by home-owners. 27.9% of the total stock is private rentals and 5.3% is public rental housing. 329,000 households were reported to have relocated due to the 2011 Tohoku disaster. Of those, 40.5% moved because their home was no longer habitable. 573,000 home-owners were reported to have carried out home repairs as a result of the Tohoku disaster. Of those, 44,000 homes were located in the Tokyo metropolitan area and 63,000 homes were in Chiba Prefecture. Ministry of Internal Affairs and Communications’ Statistics Bureau, July 29, 2014. Previous Post Previous Post: Building age vs. distance from station – which has the biggest impact on rent?